I had a great time at Gallifrey One last week, and met up with some old friends, as well as some new ones I had made online in the last year. One is Alex Murphy, who I’ve been chatting to on and off for a while. 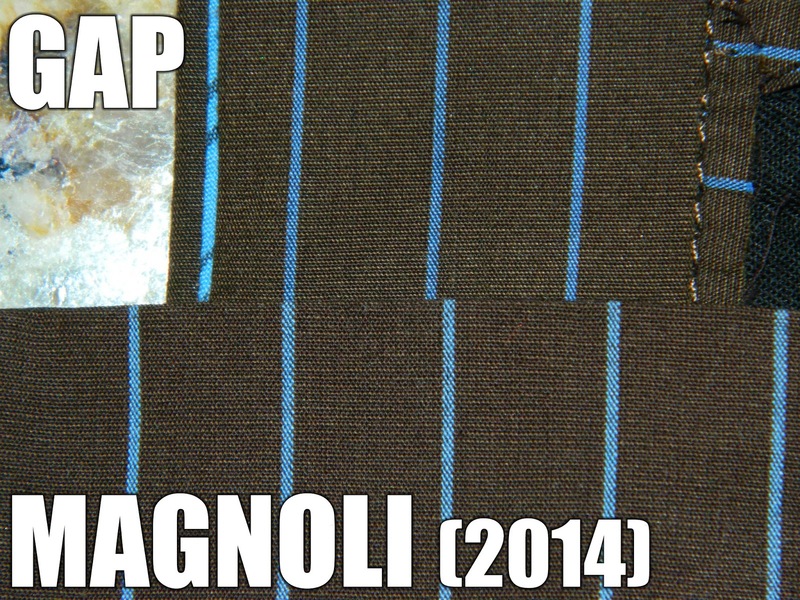 He has recently started his own blog, and has written a very informative comparison between the Magnoli replica GAP fabric and the real deal. It is reproduced here with kind permission. 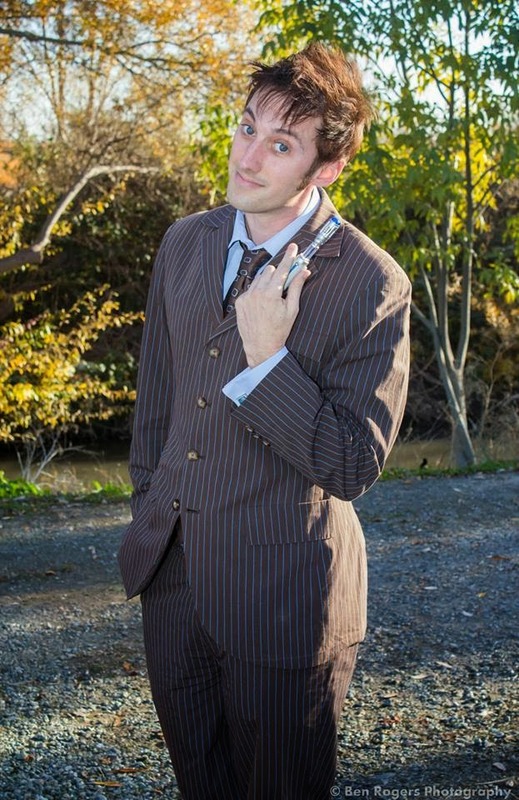 There has been much speculation in the cosplay community about where to get the best-of-the-best in terms of Tenth Doctor gear. 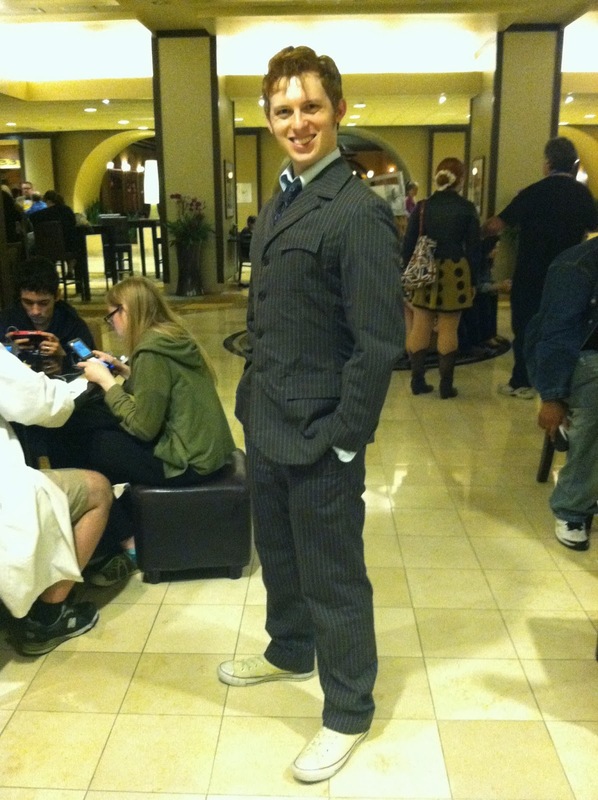 Tennant’s Doctor is extremely popular at conventions and his iconic suits and jacket are a hot commodity. Magnoli Clothiers began offering a custom reweave of both the brown and blue suit fabrics a few years ago, which they used on their Ten suits as well as selling by the yard. But at a hefty $60 per yard, cosplayers are naturally interested to know EXACTLY what they are getting for their money. I finally bit the bullet a while ago, after observing several Magnoli suits at various conventions, and decided that even if it wasn’t totally accurate, it was a damn good replica. So after taking a huge financial leap and having a custom tailored suit from Magnoli’s brown suit fabric, I had a stroke of good fortune – someone sold me scraps of an old pair of GAP trousers! Putting the two on top of each other, I hope I can give everyone who’s invested in the Magnoli fabric a huge sigh of relief! While not 100% perfect, Magnoli’s current reweave is EASILY the best available option. The stripe spacing is the biggest problem, being too wide (1/2″) between stripes (the GAP fabric is approx. 1/16″ narrower between stripes). 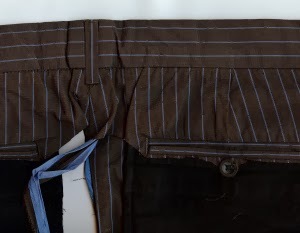 As you can see above, the blue on the stripes is nearly perfect in color, and although the Magnoli choice in browns appear too dark, this is a nearly brand new swatch, and many of the Magnoli suits I saw at Gallifrey One this year had faded to exactly the shade of the GAP trousers after some wear. 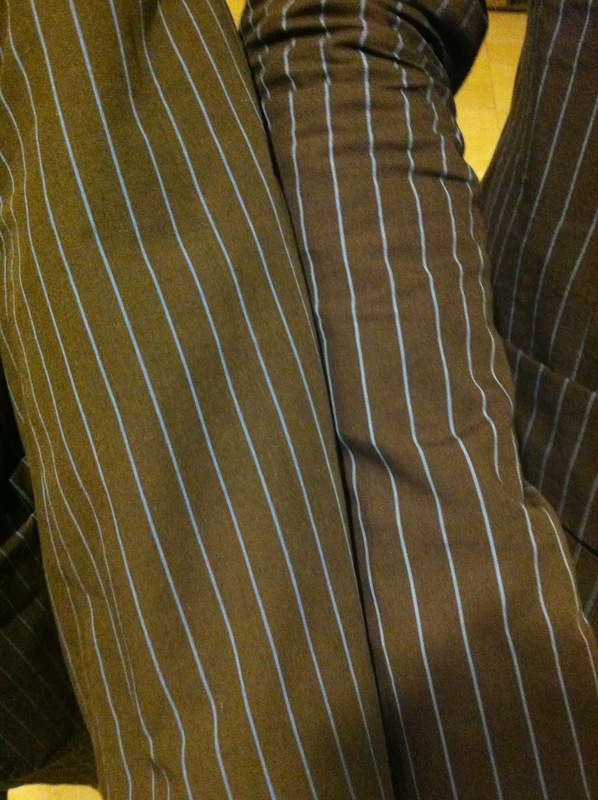 Minorly, you can see that the stripes are SLIGHTLY too wide themselves, although woven correctly. Feeling the two in my hands, the Magnoli fabric is ever-so-slightly thicker, which I think is merely a slightly thicker yarn used in the weave, which would account for the scale problems. Magnoli’s cotton is still a wonderfully lightweight choice. But the above picture isn’t all I have to offer! 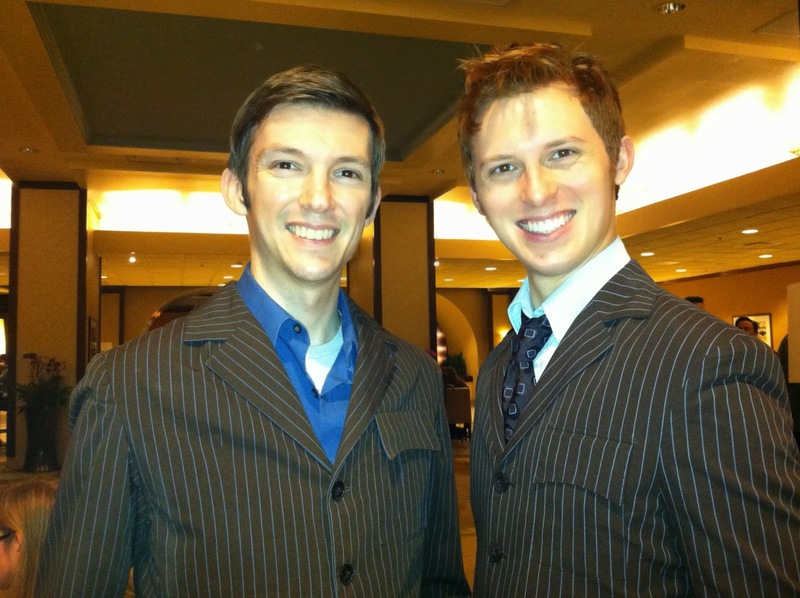 I met a fellow Ten cosplayer at Gallifrey One, introduced by some mutual friends. You may know him from Steve Ricks’ blog, as he is the one and only Kevin Coppa! Kevin is an absolutely wonderful person, and was gracious enough to oblige me in wearing his GAP suit next to my Magnoli suit for a true side-by-side comparison! He was even nice enough to let me wear his suit jacket! As you can see, you’ve really got to put the two next to each other to even notice that they aren’t the same fabric. Hopefully this can help to ease the minds of all who have shelled out the money for the Magnoli fabric – it’s WELL worth the investment! Hopefully they can even revise the stripe spacing so that a Magnoli jacket can be worn COMPLETELY seamlessly with a pair of GAP trousers! But even so, it’s an excellent investment to make, if you were on the fence about where to throw your money. Alex also has a great blog where he makes Doctor Who inspired cocktails!